Today, we are presenting Best Bread Machine Reviews! Nowadays, doing everything yourself is not an issue. An increasing number of people do a variety of DIY activities ranging from enhancing their garages to making juice at home. 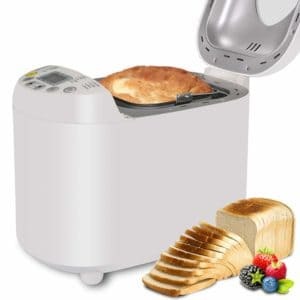 And another thing you could without leaving your home is baking bread in a bread machine! Just like other products, there is a huge variety of bread makers available out there. Unsurprisingly, some people, especially those inexperienced, may quickly become confused with the wide range of models. And that’s when the knowledge of bread machines comes in handy. To help you, we narrowed down the list of bread makers and picked 10 models, which are considered the best bread machines you could get. In addition, we have prepared a buying guide for you, which thoroughly explains the intricacies of picking the best bread machine. To top it off, we will also introduce you to the benefits of having a bread machine in your kitchen. Before we get started with the Bread Machine Reviews, let’s see our top pick! 10 Best Bread Machines Reviewed! Here in this section, we are just going to list all the 10 Bread Machines that we are going to talk about in details later on! We liked Zojirushi BB-PAC20BA the most! Although it is quite similar to another Zojirushi model we reviewed, BB-CEC20, BB-PAC20BA bakes bread much more consistently thanks to the additional heater element installed on the lid. This bread machine also allows you to create 3 custom baking programs! 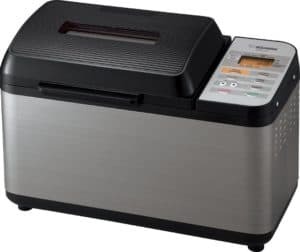 But is Zojirushi BB-PAC20BA the best bread machine for you? Let’s find out on our bread machine reviews! 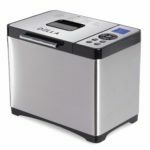 The first and more or less simple model on our list of best bread machine reviews is quite interesting as well. Its most noteworthy feature is the heating element on the lid, which helps bake the bread evenly, and also greatly browns the top. 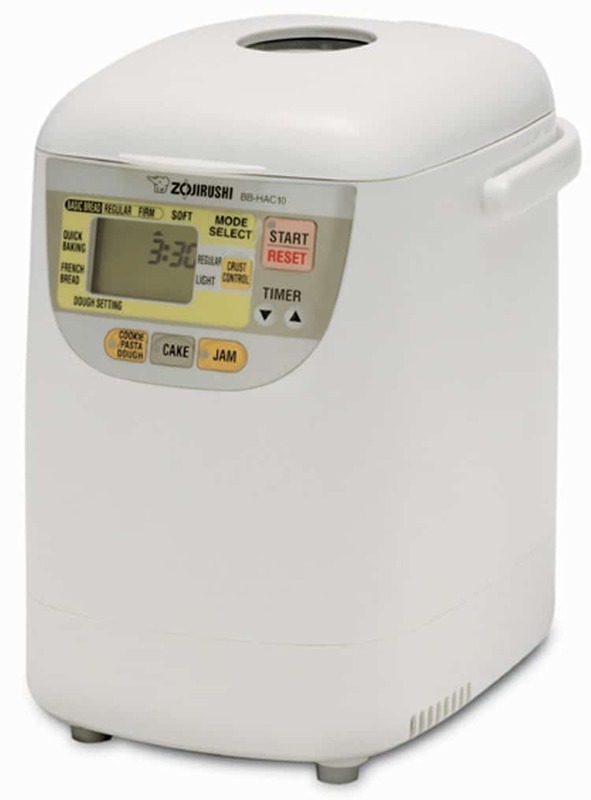 Zojirushi also markets this bread maker as a quick machine with a short 2-hour bake cycle. But that’s not everything about Zojirushi’s bread maker. While it has quite a low number of preprogrammed baking options (just 10), this bread maker allows its users to create 3 settings with custom cycles. However, the baking cycle can’t be set to more than 2 hours. BB-PAC20BA bread maker bakes only 2lb loafs with 3 crust settings. Though you can make lighter loafs if you try, it won’t be as easy as with models that do have multiple loaf weight settings. This bread machine has quite regular 1-hour Keep Warm and 13-hour delay timers. The list of common features is also complemented by nonstick utensils. Keep in mind that the bread maker’s components are not dishwasher-safe. Measuring 18 x 10.5 x 13, BB-PAC20BA is quite a wide bread maker. As for the warranty, this breadmaker is covered by a 1-year warranty. Apart from 10 baking modes, BB-PAC20BA has 3 custom baking options. Has a heating element on the lid for even baking. Nonstick bread pan and other items. Keep Warm and delay timers. Only one loaf size option. The baking cycle can’t be set to more than 2 hours. 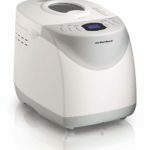 The next model on our list of best bread machine reviews is Hamilton Beach Programmable Bread Machine. It features 12 baking settings, including French, Quick Bread (with no yeast), Sweet, Dough, Jam, Cake, and several others. This model also has 2 loaf size settings – 1.5 and 2lb – and 3 crust settings – light, medium, dark. 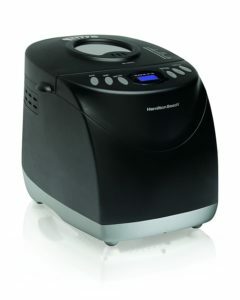 Hamilton Beach’s bread maker also has such convenient features as Keep Warm and delayed bake. The former feature, as its name implies, makes sure that your bread remains warm during a set amount of time, while the latter allows you to put all the ingredients in the machine and set a delayed start. This will allow you to leave the bread machine to work during the night. However, a number of users complained that the machine loudly beeps 10 times when the bread is ready, which means that the machine can wake you up. According to Hamilton Beach, the bread maker’s pan and 2 kneading blades are dishwasher safe. In addition, the interior elements of the machine are nonstick, meaning that cleaning the machine won’t be an issue. Given that the pan, blades, etc. are nonstick, it is quite surprising they are dishwasher-safe because the nonstick surface is quite delicate. Hamilton Beach Programmable Bread Machine measures 12.2 (H) x 14.13 (W) x 10.43 (D) inches, making this model one of the bigger ones on the list. 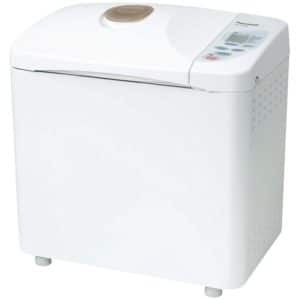 Lastly, this model is covered by a 1-year warranty.Also, it is one of our best bread machines. As for the downsides, besides the loud beeping noises, the users of Hamilton Beach Programmable Bread Machine complained that it mixes up the additional ingredients added in the process of baking quite poorly, despite having 2 kneading blades. 2 loaf size and 3 crust settings. The pan and kneading blades can be washed in a dishwasher. Keep Warm and delayed baking. Mixes up the ingredients poorly. Makes loud beeps when the bread is done, which can be disturbing if you bake bread during the night. Doesn’t have inbuilt 1lb loaf settings. SKG’s bread maker has more baking settings. To be precise, 19, including Basic, French, Whole-wheat, Gluten Free, Corn Bread, Jam, Yogurt, and other modes. SKG Automatic Bread Machine also has 3 loaf size settings – 1, 1.5, 2lb – and 3 crust settings. This model has an up to 1-hour Keep Warm feature and a 15-hour delay timer. The delay settings of this machine are more flexible compared to other models that mostly have 13-hour delays, although it probably won’t make much difference for you. Unlike Hamilton Beach’s model we just examined, the pan and the kneading blade of this model are not dishwasher-safe. However, in reality, washing them by hand shouldn’t take too much effort. As for the interior elements like the baking pan and the kneading blades, they are nonstick. 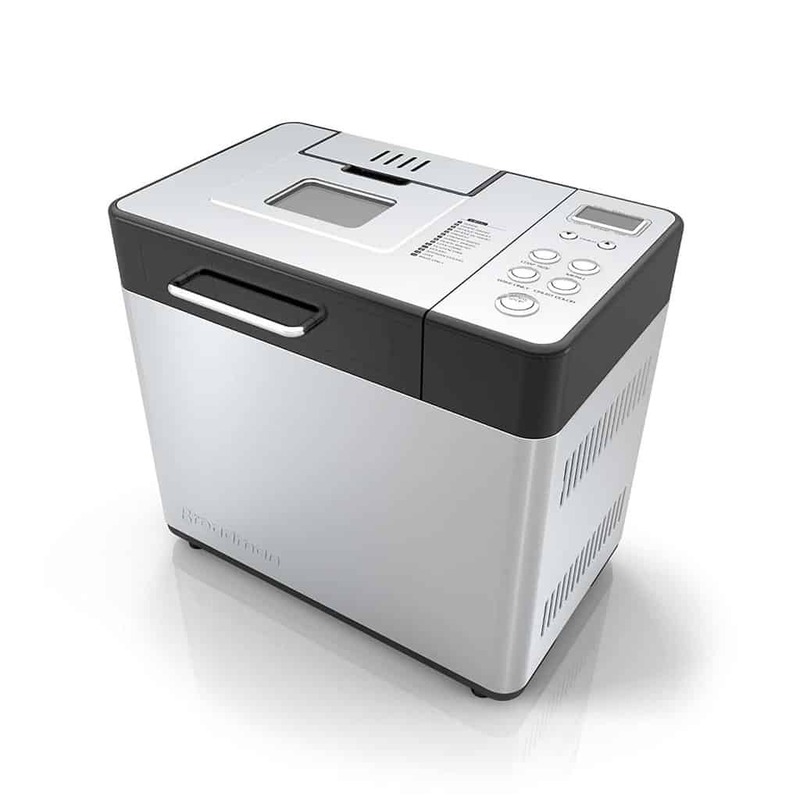 SKG Automatic Bread Machine is a little bit more compact than Hamilton Beach’s model – it measures 13 x 11x 9 inches. 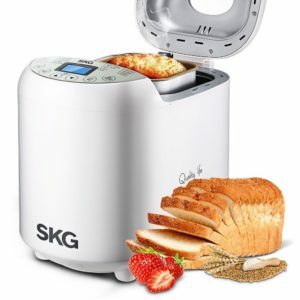 Finally, SKG’s bread maker is covered by a 2-year warranty plus some kind of a 1-month trial for Amazon customers. We are not entirely sure what the latter means, but maybe it is some kind of a 1-month money back guarantee. In regard to the disadvantages, some users complained that even if you set the machine on the corresponding mode, it doesn’t quite bake 2lb bread, though this could be more related to the recipes than to the machine itself. Quite a good number of features for an affordable machine. 3 loaf sizes and 3 crust settings. 1-hour Keep Warm and 15-hour delay features. 2-year warranty plus 1-month trial for Amazon customers. May have some issues with baking 2lb bread. Yet another affordable model on our best bread machine reviews. Oster’s bread maker isn’t as functional as SKG’s model, but it still offers 12 baking settings for a good choice of bread, dough, and jams. Oster Expressbake Bread Machine can bake up to 2lb loafs, though the manufacturer doesn’t specify what settings this machine has. Additionally, this model offers 3 crust settings. 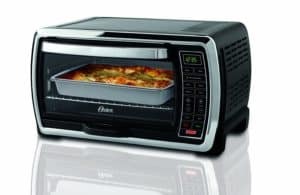 Oster Expressbake Bread Machine has a Keep Warm setting as well as a 13-hour delay mode. Though the delay is 2 hours shorter than SKG bread maker’s timer, it should still be enough for the most of the people. Like other bread makers, Oster’s bread machine features a nonstick pan and kneading blade, though they are not dishwasher-safe. From the standpoint of size, Oster Expressbake Bread Machine is neither too small nor large – it measures 12 (L) x 12 (W) x 11 (H) inches. Oster Expressbake Bread Machine is covered by a 1-year warranty. Some users of this bread machine complained about its issues with heat leakage and ensuing underbaking of bread. However, we can’t say that this problem is common – there simply have been enough reviews mentioning heat leakage for us to cover it. Bakes up to 2lb bread loafs. Has Keep Warm and delay timers. Possible issues with heat leakage. 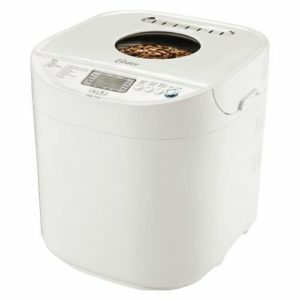 CBK-200 by Cuisinart is a quite interesting model of a bread maker. Its most remarkable feature is the convection fan that circulates the hot air within the machine to help avoid underbaked spots. Overall, convection makes bread crustier. Another eye-catching feature is the design of the breadmaker itself. Its built from stainless steel, which in combination with the box-like shape of this bread machine makes it look quite simple yet solid. CBK-200’s design will surely fit kitchens with similar-looking appliances. CBK-200 is quite bulky, measuring 18 x 12-1/5 x 14-7/8 inches.CBK-200 also has 16 baking settings, including Low Carb, Gluten-Free, Artisan Dough, and others. This bread maker has 3 loaf size settings as well 3 crust settings. In addition, CBK-200 bread maker comes with nonstick utensils, though we can’t say whether or not they are safe for dishwasher use. Cuisinart’s bread maker has a 1-hour Keep Warm timer and a 12-hour delay function. 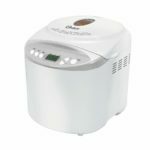 It is covered by a 3-year warranty.And it is one of our best bread machines review.As for the downsides, a number of users complained that CBK-200 tends to undermix the ingredients added to the dough. 3 loaf size and 3 crust settings. Convection fan for better hot air circulation. 1-hour Keep Warm function and 12-hour delay timer. Tends to undermix the ingredients. CBK-100 is quite similar to CBK-200, although this model is a bit simpler. It features 12 baking modes instead of 16. CBK-100 also doesn’t have a convection fan. In regard to the rest of the functions, this breadmaker is pretty much identical to CBK-200. Firstly, CBK-100 has 3 loaf size and 3 crust settings. In addition to the 13-hour delay timer, CBK-100 has an up to 1-hour Keep Warm function. The utensils of this bread maker such as the pan, kneading blade, cup, and spoon are dishwasher-safe, apart from being nonstick. The design of CBK-100 is also similar to the design of CBK-200. Measuring 18 x 12-1/5 x 15 inches, CBK-100 is slightly bulkier than CBK-200. 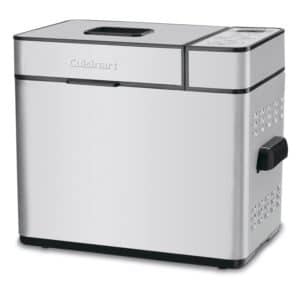 Cuisinart CBK-100 Bread Maker is covered by a 3-year warranty. Users have complained that CBK-100 doesn’t bake the bread consistently. This could be due to the absence of a convection fan in this model. 3 loaf size and 3 crust modes. Complaints about bread bake consistency. Although SD-YD250 by Panasonic isn’t the cheapest bread maker on our bread machines reviews, it has the least number of baking modes. It can only bake white, whole-wheat, multigrain, French, and quick bread/cakes. However, SD-YD250 is the only model on our list that has an option for extra-large bread size! This breadmaker bakes 1.5, 2, and 2.5lb loafs. It also has 3 crust settings included. Another notable feature of SD-YD250 is that it has an automatic yeast dispenser which, as its name implies, dispenses yeast at the optimum time. You just need to put in the necessary amount of yeast at the beginning and wait until the bread is ready. As you would expect, the baking pan and kneading blades of SD-YD250 have a nonstick surface. However, they are not dishwasher-safe.SD-YD250 also has a 1-hour Keep Warm timer as well as an up to 13 hours of delay option. After we have looked into some monstrous bread makers, SD-YD250 seems tiny with its dimensions of 14 x 13.5 x 9 inches. For a bread maker than can bake 2.5lb bread, the size of SD-YD250 is surprisingly moderate. Panasonic offers a 1-year warranty for this bread maker. Though SD-YD250 is one of our best bread machines reviews, Unfortunately, it doesn’t have a window on the lid, unlike other models we examined. That’s because the window’s space is occupied by the auto yeast dispenser. Bakes up to 2.5lb bread! Has an auto yeast dispenser. Features a nonstick baking pan and blades. Rather compact for its baking capacity. Doesn’t have a window on the lid. In regard to overall functionality, BB-CEC20 is quite similar to another model by Zojirushi we already reviewed, the BB-PAC20BA. BB-CEC20 has only one loaf size and 10 settings plus 3 custom modes. It also features 3 crust settings, like the most of the bread makers we have reviewed today. It has the same 1-hour Keep Warm timer as well as the 13-hour delay option. BB-CEC20 also has a quick, 2-hour baking cycle. The baking pan and other utensils are nonstick but are not dishwasher-safe. 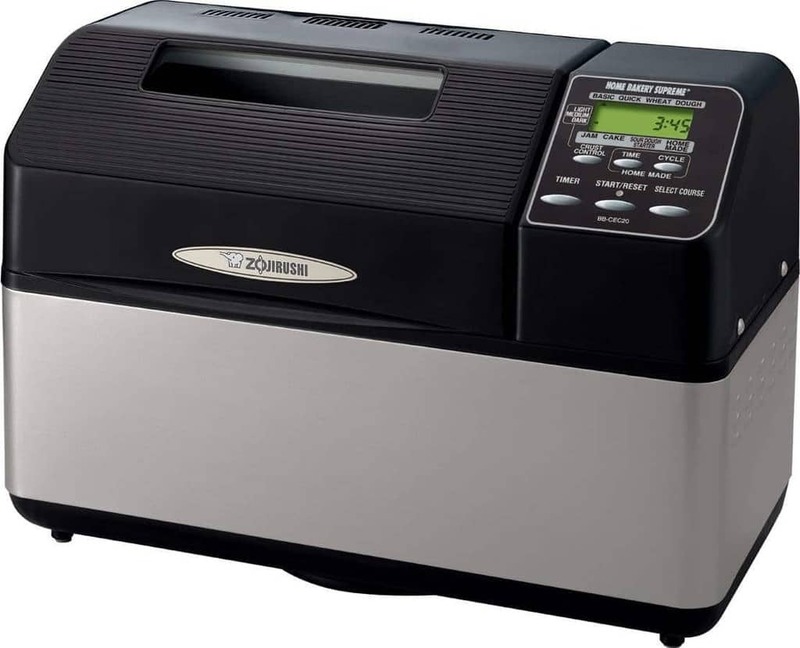 BB-CEC20 also measures around the same as BB-PAC20BA – this bread maker’s dimensions are 12.8 x 13.6 x 18.9 inches, which is slightly bigger than the previous Zojirushi model. The two models even cost approximately the same and have the same 1-year warranty! The main difference between the two Zojirushi bread makers is that BB-CEC20 has an auto shutoff feature while the BB-PAC20BA we reviewed earlier does not. This quite handy feature cannot be overestimated when it comes to safety. While BB-CEC20 bakes bread greatly, users have complained that it has issues with sometimes overbaking the bread. Apart from 10 preprogrammed baking modes, has 3 memory settings for custom cycles. Has an auto shutoff feature. Keep Warm and delay timer options. Here comes the most controversial model on our list of best bread machines reviews. It has a great set of features as well as an equally “great” issue. But let’s examine the good first. Breadman’s bread maker has 14 baking functions, including Gluten-free, Low-carb, and Artisan. It has a standard set of loaf size and crust settings, 3 each. The inseparable feature of modern bread makers, a nonstick pan that will shortly play a bigger role in this particular review, is also here. You also get 1-hour Keep Warm function as well as 13-hour delay setting. 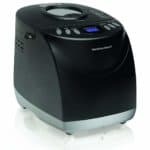 Breadman Professional Bread Maker has a fruit and nut dispenser, which is designed to automatically dispense the ingredients at the right time. 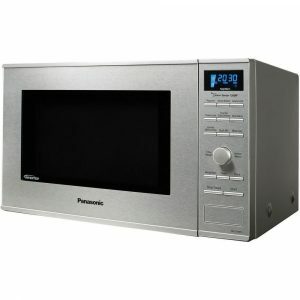 However, unlike Panasonic SD-YD250, this model has a lid window – the ingredient dispenser doesn’t take up its space. Another remarkable feature of this model that others do not have is the collapsible kneading paddle. Those who use bread makers know that the paddles leave holes in the bottom of the bread. A collapsible kneading paddle is designed to resolve this issue, though it doesn’t always work perfectly. This bread maker is backed up by a 2-year warranty. Now comes the time for the downside of Breadman Professional Bread Maker. It is the cover of the baking pan. Although this isn’t a very common issue with this model, most of the negative reviews on Breadman’s bread maker mentioned that the cover peels off after a couple of uses. Yes, you can request a replacement, but still, if you are unlucky enough to get this model with a poor-quality baking pan, you will spend some time and nerves before getting a spot-on machine. Besides, the fragments of the cover could get into the bread! Another, not as crucial downside is that this bread machine is quite big – it measures 16.6 x 12 x 15.6 inches. 3 loaf size and 3 crust options. Comes with a nonstick baking pan and utensils. Keep Warm and delay functions. Has a collapsible kneading blade. A large number of complaints on the peeling surface of the baking pan. This bread machine is quite large. Closing off our best bread machines reviews by a unique and rather specific model! Although BB-HAC10 isn’t the most functional bread maker we examined today, it is quite a great model. BB-HAC10 can only bake up to 1lb loafs. 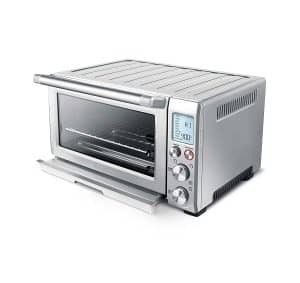 The range of baking functions is narrow as well – BB-HAC10 can make just cookie/pasta dough, fruit jams, basic bread (regular, firm, soft), French bread, dough, and quick bread. At least, this model has the regular set of 3 crust options. BB-HAC10 comes with a nonstick baking pan and kneading blade. Unfortunately, it isn’t specified whether or not the pan and blade are dishwasher-safe. This bread maker also has 1-hour Keep Warm function as well as an up to 13-hour delay timer. One of the advantages of BB-HAC10 is that it measures just about 8 x 11 x 12 inches and has a small footprint. It is also quite light with a weight of around 13 pounds. Plus, BB-HAC10 has a sturdy handle to aid you with easy carrying. Although this model has quite a beefy price tag, it generally is a better choice than the other models we reviewed, given that its features are enough for you. It doesn’t have any major issues and, most importantly, bakes bread very well.This bread machines reviews will help you to choose the best ones for you.Lastly, Zojirushi BB-HAC10 is backed up by a 1-year warranty. Great for baking 1lb loafs! Nonstick baking pan and kneading blade. 1-hour Keep Warm and 13-hour delay functions. Lightweight and easy to carry thanks to the convenient and sturdy handle. You would expect more baking functions for the price. Bakes up to 1lb bread only. Now that you have seen quite an expansive list of what we and others think are the best bread machines, a new question arises – how do you choose the best model for yourself? To help you answer that question, we are now going to examine the most important features of bread machines. The most crucial quality of a bread machine is how it makes bread. After all, that’s what we buy bread makers for. Unfortunately, it is nearly impossible to estimate how well a bread machine will be baking bread by just reading its features. Neither you can understand how consistent the bread will be by examining the images of a baking pan. A lot of factors impact the final result, and you cannot account for each of them. The best and safest way to find out the baking quality of a bread machine is to read user reviews on them. With each of the candidate models, thoroughly examine as many reviews as you can. Only then can you understand if this or that bread machine bakes bread the way you want it. And unfortunately, high price doesn’t mean good bake quality in 100% of the cases, although expensive bread makers are mostly very consistent and bake bread greatly. Nonetheless, you shouldn’t neglect the importance of looking into the user reviews. Typically, bread machines come with around a dozen preprogrammed baking functions. Most of them include dough, French bread, different options for bread softness, jams, pizza, and other baking modes. Some bread machines offer as many as 19 settings, like SKG Automatic Bread Machine we examined, while others feature only 6. Besides a number of preprogrammed baking functions, some machines also offer internal memory for the users to customize the baking process. Those models allow users to customize each of the available cycles. Most of the time, deep customization isn’t necessary because the preprogrammed baking functions deliver great results. However, if you absolutely need to be able to create your own baking functions, look for a model that has them. Keep in mind though that most of the bread machines out there do not have programmable cycle options. For instance, only 2 out of 10 models we reviewed have custom cycle capabilities! Besides, the presence of this feature doesn’t correlate with the price, so you could find it on cheaper models. Among the main features of bread machines are loaf size and crust settings. In fact, they may be the most important features for you! Most of the bread makers offer 3 settings for loaf size – 1, 1.5, and 2lb – and 3 options for the crust – light, medium, dark. However, this can vary from model to model. Some bread machines have only one inbuilt loaf size, like the reviewed Zojirushi models, while others can bake even bigger 2.5lb loafs, like Panasonic SD-YD250. To make the right choice, imagine what loaf size you want. To give you a little bit of a perspective, a 1lb loaf yields around 8 slices, while a 2.5lb has around 20. Calculate approximately how many servings you need per bake, and you should easily be able to pick the right machine. As for crust settings, they are more related to your taste than anything else, so pick the bread machine that has the crust modes you need. A kneading blade is what takes care of mixing the dough as well as the ingredients you add. You shouldn’t look really deep in the number of kneading blades a bread machine has. After all, we have reviewed machines that bake and mix bread inconsistently despite having 2 kneading blades! However, keep in mind that kneading blades are much more efficient in horizontal baking pans than in vertical ones. In fact, one reason for undermixing issues is that the blade cannot evenly spread the ingredients in tall baking pans! Some bread makers come with collapsible kneading blades, like Breadman Professional Bread Maker. The thing is that non-collapsible blades leave holes at the bottom of the bread. Collapsible kneading blades are designed to resolve that issue, although it may not work as consistently as you may want. If you know that you will hate holes in your bread, buy a model with collapsible kneading blades. Nonstick baking pans, spoons, etc. Almost all bread makers out there come with nonstick baking pans, spoons, and other utensils. The reason we accentuate the nonstick surface is the problems you could run into if you are not careful. The nonstick surfaces are typically quite delicate, and most of the manufacturers do not recommend users to wash the baking pans and other items in dishwashers. You could do it more or less safely, but you may one day discover that the surface of the pan or the kneading blades is damaged. Some manufacturers state that their baking pans and kneading blades are dishwasher-safe. However, keep in mind that this could be a marketing trick. In fact, chasing bread makers with dishwasher-safe components may even be pointless – after all, the nonstick baking pans, spoons, blades, and whatnot are extremely easy to wash manually. Most of the modern bread makers make beeps when it’s time to add ingredients like nuts or yeast. Unfortunately, not all manufacturers mention this function in their product descriptions, so if you absolutely need an audible reminder, dig a little bit deeper to find out whether a machine has it or not. The main inconvenience of bread makers in regard to ingredients is that you have to manually put them in when necessary. However, there are bread machines out there that have ingredient dispensers. You just put in the fruit nuts or yeast into the dispenser, and then the machine dispenses them at an optimum time. As an example, Breadman Professional Bread Maker has a fruit and nut dispenser. The delay function isn’t that crucial, but it can come in handy. Basically, when you set your bread machine on a delay, it will start baking after the specified amount of time. You just need to put the necessary ingredients in the machine and set the delay. This feature is particularly useful if, for example, you want to be woken up by the aroma of freshly baked bread. Alternatively, you could set the delay when leaving for work – when you come home, the bread will be just ready. Most of the bread makers have a delay function. What differs is the delay time – some bread makers have up to 15-hour delay timers, while others offer “only” 12 hours. The Keep Warm function is another common feature of bread makers. As its name implies, it allows you to keep the bread warm for a specified amount of time, which goes up to 60 minutes with most of the machines. This could come quite in handy if you want to briefly leave and don’t want to come back to an already cool bread. A lid window is another feature that isn’t that important yet is desirable. The majority of bread machines have a window on the lid, but there are exceptions like Panasonic SD-YD250. Overall, because the process of bread baking is automatic, you won’t have to keep an eye on your bread to know when you should turn off the bread machine. However, if you want to have a little bit more control over baking, look for a bread maker that has a lid window. Typically, bread makers do not make a lot of noise. They usually get the noisiest when kneading. 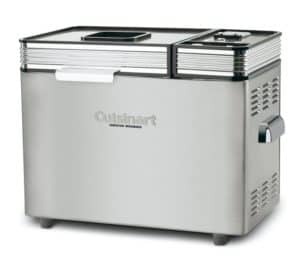 All in all, bread makers are among the quietest kitchen appliances you can get. You can be sure that the machine baking overnight won’t wake you up. What could disturb your sleep, however, is the beeping noise bread machines make when the bread is ready. And the worst thing is that not all bread makers allow you to turn off that beeping sound! However, this shouldn’t be a problem if your kitchen is not directly next to your bedroom. A feature you should definitely account for is the size of a bread machine. While bread makers are mostly not very big, some of them can take up quite considerable space. And it’s not about raw dimensions of the machine but its orientation as well. For example, Zojirushi BB-HAC10 is tall rather than wide, meaning that it has a small footprint. It won’t take up too much space on your countertop, but you will have to ensure it has enough room from above. On the other hand, Zojirushi BB-PAC20BA is quite wide and not so tall. It will definitely occupy quite a bit of the space of your countertop. Overall, to choose the most convenient bread maker, account for space you can provide it with and keep in mind the machine’s orientation. Appearance is a matter of taste, and it does not impact the quality of bread making. However, you probably want a bread maker that fits your kitchen stylistically. Most of the bread makers look the same, but you could find some exceptions like the Cuisinart bread makers we reviewed earlier. From the standpoint of aesthetics, you should listen to your inner voice, but keep in mind that you should not buy a bread machine for the sake of its looks. Do not forget about more important features.That’s generally it for the features of bread makers. However, there is one thing that we would like to especially stress. Apart from the advantages and features of bread makers, you should look into their disadvantages as well. And we do not mean the insufficient number of baking functions or bulkiness. We don’t even mean the quality of bread baking. Yes, they all are important, but there is a more significant problem. Some disadvantages could be potentially harmful to your health. Remember the issues with the Breadman Professional Bread Maker? The peeling nonstick surface not only makes the pan or the kneading blades look ugly or lose their durability. Fragments of that nonstick surface could get into your bread. You certainly don’t want that! Again, look into user reviews to get the best idea of what you could get with each of the bread machines. And only then should you make the final choice. redstaryeast also tells us about issues with bread makers and how to fix it. A bread maker is a great machine, but should you buy one? If you are hesitant to say for sure, let us present you with a number of benefits of having a bread machine in your kitchen. When shopping in a grocery store, you can’t always be sure that the bread sold there is fresh. That’s not an issue if you bake bread at home! Moreover, a bread machine will allow you to have fresh bread anytime you want! Again, you can’t be sure what kinds of ingredients have been put into the bread you bought from the local store. On the other hand, when you bake bread at home, you have full control over what types and quantities of ingredients you make your bread with. That control will be especially helpful if you have some kinds of allergies because you can avoid the troublesome ingredients altogether. While bread makers can be expensive, they are surely money-saving in the long run. Of course, this depends on the ingredients you use when making your bread, but buying bread from the store can be more expensive than baking it yourself, especially if you have some dietary restrictions. Apart from bread, modern bread makers allow you to bake a variety of pizzas, jam, pasta, dough, and more, depending on the number of baking functions your bread machine has. That’s it for our bread machine reviews! Hopefully, you have found out something that will be able to help you with finding the best bread machines! You have seen 10 great models, each with its own set of lovely advantages as well as sad disadvantages. You now know what the most important features of bread machines are. Besides, you understand why it is important to look into the downsides of bread machines apart from their features and advantages. And lastly, you know how bread machines can help you! If you have decided to pick a bread machine for yourself, do not hurry, understand your requirements, do in-depth research, examine all available models of bread machines, and make your final choice! This way, you can be sure that you will the best bread machine you could buy!